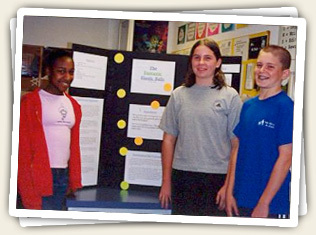 Science Fair projects encourage prolonged critical thinking and genuinely prideful results. After receiving instruction in the scientific method and the strategies for completing a science project, Mt. Helix Academy’s 7th and 8th graders develop their own science fair project and submit it to the Greater San Diego Science and Engineering Fair. Over the past 12 years, all of our 7th and 8th graders completed a science project and every student who competed in the Science Fair’s Junior Division was awarded a prize by the Science Fair’s judges. Given the number of students in its Middle School Module, Mt. 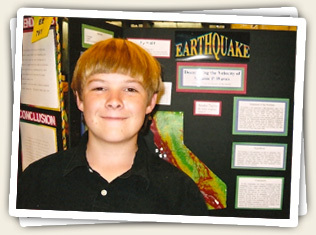 Helix Academy is among the most successful schools in the San Diego area in Science Fair competition. 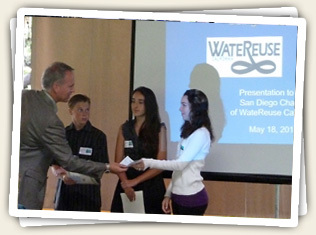 7th Grader, Bailey LaFlam, receives her special award from the San Diego WateReuse Foundation for her study of grey water use. Austin Taylor proudly showing off his multi-award winning project on seismic p-waves.